Most people would argue that silence isn't communication. In fact, they'd probably say that it's just the opposite of communicating. But the truth is that silence is a really good communication skill. A common communication pattern in problem relationships is one partner talking too much and the other partner talking too little. So is there really a place for silence in healthy relationships? Yes. It would be easy to assume that it's the men who are too quiet and the women who talk more than necessary, but that's not always the case. Sometimes these roles are reversed. We all can agree that too much of an imbalance between partners as to who does the talking is going to be a problem. 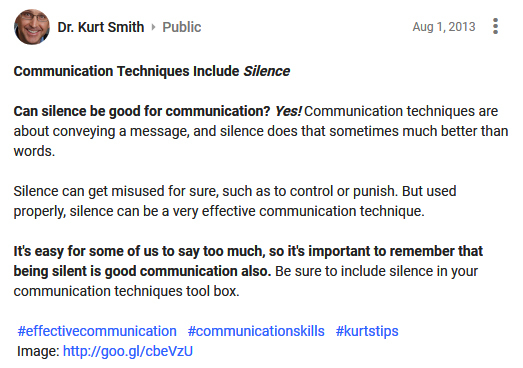 Yet there is a place for silence among good communication skills. To begin to understand how, take a look at this social media post I wrote. A well-known statistic is that 93% of communication is non-verbal. There's some dispute among experts as to the exact accuracy of that number. However, there is no dispute among researchers and communication experts that the majority of communication takes place in other forms than the words we speak. Considering this fact it begins to make some sense as to how silence could be a good communication skill, particularly since it's true that so much of our communication is non-verbal. More than a few of us 'have to have' the last word or 'win' the conversation. This is a big problem in the communication between many couples. Silence is one way to stop ourselves from feeding this bad habit. Many of us tend to over explain things. One of the reasons for this is the belief that we need to get approval or acceptance from the other person before doing something (often there's not conscious awareness of this belief). Over explaining, or more exactly seeking approval, can create an unhealthy relationship. Verbal communication can become abusive by some partners. 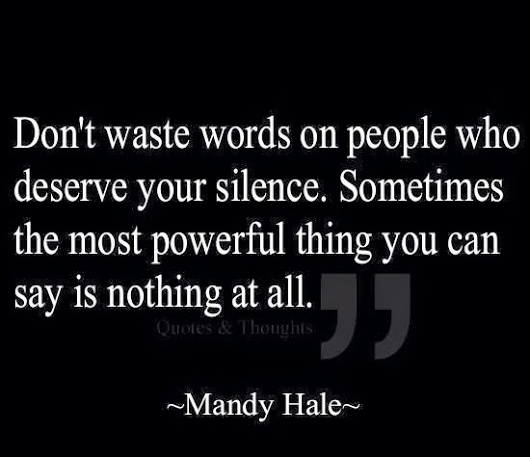 One of the ways to de-escalate verbal abusive is to be silent. Now I'm not recommending silently accepting abuse (here are examples of verbal abuse is like). But I've worked with a lot of partners who fuel the verbal abuse from their partner with their 'attacks' back (Are You Tired of Hearing "Sorry"? - a common verbal abuser response). The researcher who came up with the 93% of communication is non-verbal statistic is Dr. Albert Mehrabian. His studies found that 7% of a message is conveyed through words, 38% through vocal elements (tone, volume, etc. ), and 55% through nonverbal elements (facial expressions, gestures, posture, etc). Other good communication skills include tone and facial expressions. After all, how many of us have heard, "it's not what you said, it's the way you said it" or "I saw you roll your eyes"? We can become very effective communicators when we learn to adjust our tone to the situation, and manage our gestures so they don't pile on to our words (more effective communication skills). Think about how you might be able to use silence more in your relationship. It's one of the best good communication skills you can use at times. Was this post helpful? If so, sign-up at the bottom of this page to get notified of new posts each week -- or follow me on Facebook or Twitter where I post daily relationship and self-improvement tips just like this one. What Is A Nagging Wife, Really? Mr. Marriage Counselor: "We're Married but Can't Communicate"
Mr. Marriage Counselor: "We Always End Up In a Fight"